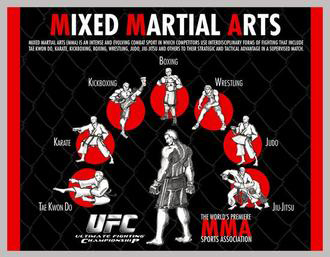 Mixed Martial Arts (MMA) a full-combat and unarmed sport, is a mix of wrestling, boxing, and traditional martial arts. Known for its outright aggressiveness and brutality, it has very few rules, other than those minimally required to maintain a competitor’s safety. MMA’s popularity has increased in recent years, despite the fact many sports regulators remain wary of its legitimacy as an organized sport. In such an aggressive sport, it is hard for a fighter to come out as LGBTQ, where a high-profile LGBTQ MMA fighter might not gel with the public stereotype of tough athletes in the MMA world, and MMA fighters who come out could face adverse fan reaction. Yet the sports’ largest organization, Ultimate Fighting Championships (UFC), has expressed its support for diversity in the sport, and sponsors several HIV/AIDS awareness programs. Recently, weight classes, protective body equipment, and a professional women’s division were introduced. Indeed, the vast majority of publicly-out LGBTQ MMA fighters are lesbian. To date, there is only one gay professional fighter, Shad Smith of the United States. Lesbian, Amanda Nunes of Brazil, has become the first openly-gay person winning a UFC championship belt, and Fallon Fox is the first transgender professional MMA fighter. Queerbio have listed some professional LGBTQ MMA fighters, who hail from the United States, Brazil and Mexico. To see the list and read their biographies, CLICK HERE.